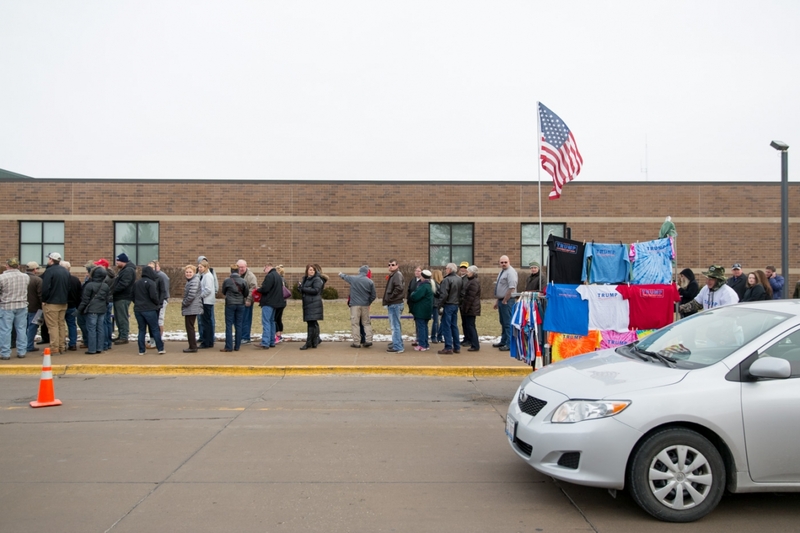 Bryce Vickmark/ZUMA Press 1/24/16 – People lined up outside of Muscatine High School to see Donald Trump, the Republican candidate for President of the United States, on a campaign stop in Muscatine, Iowa on Sunday. 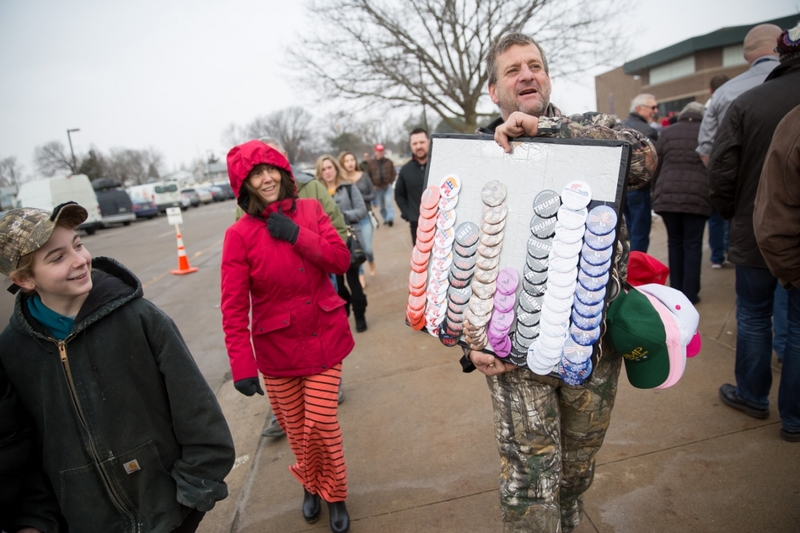 Bryce Vickmark/ZUMA Press 1/24/16 – A seller of Trump memorabilia sold items to people lined up outside of Muscatine High School to see Donald Trump, the Republican candidate for President of the United States, on a campaign stop in Muscatine, Iowa on Sunday. 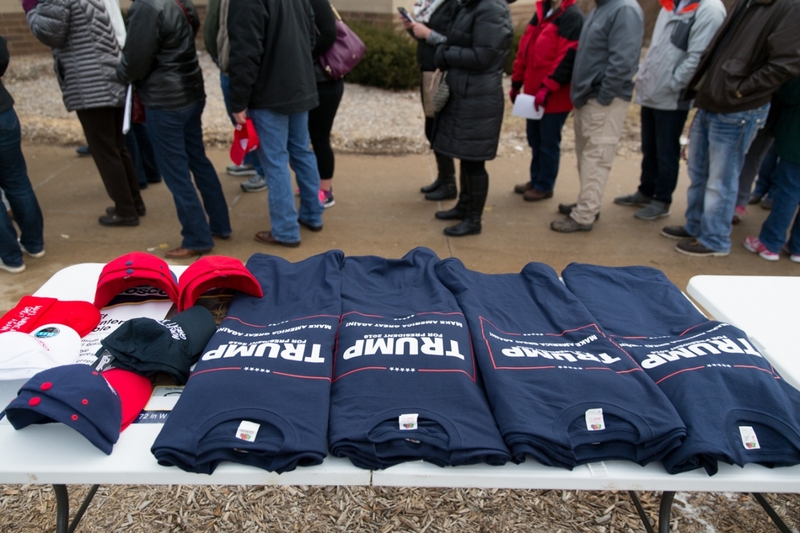 Bryce Vickmark/ZUMA Press 1/24/16 – Trump memorabilia for sale with people lined up outside of Muscatine High School to see Donald Trump, the Republican candidate for President of the United States, on a campaign stop in Muscatine, Iowa on Sunday. Bryce Vickmark/ZUMA Press 1/24/16 – The crowd grew as Donald Trump, Republican candidate for President of the United States, was speak at a campaign stop at Muscatine High School in Muscatine, Iowa on Sunday. Bryce Vickmark/ZUMA Press 1/24/16 – The crowd grew as Donald Trump, Republican candidate for President of the United States, was about to speak at Muscatine High School in Muscatine, Iowa on Sunday. Bryce Vickmark/ZUMA Press 1/24/16 – A Secret Service member scans the crowd before Donald Trump, the Republican candidate for President of the United States, was to speak at a campaign stop at Muscatine High School in Muscatine, Iowa on Sunday. Bryce Vickmark/ZUMA Press 1/24/16 – A potential Donald Trump supporter held a pro Trump flyer at Muscatine High School in Muscatine, Iowa. The Republican candidate for President spoke there on Sunday. Bryce Vickmark/ZUMA Press 1/24/16 – A Donald Trump supporter held a sign up before the Republican candidate for President of the United States addressed the crowd at Muscatine High School in Muscatine, Iowa on Sunday. Bryce Vickmark/ZUMA Press 1/24/16 – A potential Donald Trump supporter sported an American flag scarf at Muscatine High School in Muscatine, Iowa. The Republican candidate for President of the United States spoke there on Sunday. Bryce Vickmark/ZUMA Press 1/24/16 – A Donald Trump supporter wears a pro Trump yamaka that read “Donald Trump 2016” at Muscatine High School in Muscatine, Iowa. The Republican candidate for President of the United States spoke there on Sunday. Bryce Vickmark/ZUMA Press 1/24/16 – Camera roll as Donald Trump, Republican candidate for President of the United States, addresses the crowd during a campaign stop at Muscatine High School in Muscatine, Iowa on Sunday. Bryce Vickmark/ZUMA Press 1/24/16 – Potential supporters take selfies as Donald Trump, Republican candidate for President of the United States, addresses the crowd during a campaign stop at Muscatine High School in Muscatine, Iowa on Sunday. Bryce Vickmark/ZUMA Press 1/24/16 – Donald Trump, Republican candidate for President of the United States, addresses the crowd during a campaign stop at Muscatine High School in Muscatine, Iowa on Sunday. Bryce Vickmark/ZUMA Press 1/24/16 – Donald Trump, Republican candidate for President of the United States, waves goodbye during a campaign stop at Muscatine High School in Muscatine, Iowa on Sunday.